Question of Giridhari: By definition we accept that guru should belong to a tradition, parampara. No doubt it’s like this. But the last king of Bulgarians was German, not Bulgarian. The prince of the demons Prahlada Maharaj was not a demon, he was a bhakta. I’m sure there are so many gurus who do not come from a parampara. This is another incompatibility. Could you please harmonize and put this together? Swami Tirtha: I can say yes, it’s true – many bona fide gurus can come from outside the tradition. But even if somebody is able to come from outside any tradition, usually they commit themselves to the formalities. The highly elevated chosen ones are free to come, stay and go. But we are not free to come, to stay and to go – I mean people in general. Therefore it is more safe to follow a tradition. And the great teachers usually give this example. But it is possible for some bona fide teachers to come in very unusual, very special ways. What is unexpected and unusual for us is very much usual for them. What may be very formal on the material platform is very essential on the spiritual platform. We should be able to judge who uses either the tradition or the non-tradition as an excuse. Because many times we want to support ourselves, we want to prove ourselves or our position. And therefore we hide behind the dhoti of our spiritual masters. And if we follow their habits, gestures and words we think that we are on the same platform. 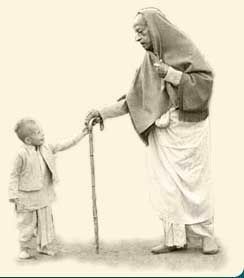 There’s a very good example: Shrila Prabhupad, as a seventy, almost eighty year old man, had a walking stick. And the young disciples, twenty year old, also started to have the same stick. ‘If my Gurudev has, I also should have.’ Sorry to say, it was so ridiculous! Some of them were coming with a stick – why? So, it’s not the imitation. Don’t hide behind the dhoti of your spiritual master, don’t quote him where you have to quote yourself, where you have to show your power. Don’t try to hide your shortcomings with his name. Many times we use the great ones to hide our mistakes. But anyway, why should we speak too much about mistakes, problems and troubles? The shortcomings of others don’t help us. We should try to commit ourselves as much as possible to the supreme, the highest truth that we had found. And if we find a pure source and a pure transmission, then if we can act to the best of our pure qualities, we are fortunate. Therefore we should faithfully follow these nine processes of devotional service – shravanam, kirtanam, smaranam, etc. – because if we enter deeper and deeper into our divine commitment, definitely we should have a better and a more realistic picture. Swami Tirtha: How come?! He was initiated. He took initiation from John the Baptist. This is parampara. Question: What is the difference between imitation and real following? Swami Tirtha: Very simple: from the fruits you can judge. By imitation you will not reach any fruits, you will be frustrated; and by real following you will reach your goal. Unfortunately we shall recognize this only at the end – ‘Whether my following was real or only imitation’. But don’t worry, the real gurus will cut your imitation tendencies, however painful it is, they will do it. Because they don’t expect anything in return. You know, to correct people’s mistakes is not a popular job. Because nobody will like that. But we can be sure that if we are committed to a real master, a sad-guru, he will cut everything that is formal or artificial or imitative in our progress.